Shabestar plain aquifer is located in the northeast of the hypersaline Urmia Lake, northwest Iran. There are two types of the aquifer in the plain: an unconfined aquifer that covers the plain and a confined aquifer that is just in the vicinity of the lake. In recent years, some of the agricultural wells have become salinized by saline water due to unrestricted groundwater pumping. Groundwater in the confined aquifer in comparison with the above unconfined aquifer is of good quality. The salty Urmia Lake is considered the most probable source of groundwater salinization. Other potential sources of groundwater salinization could include halite dissolution, and halite is exposed at the southern end of Shabestar plain, and evaporation from the shallow water table. The water samples, based on their total dissolved solid and chloride contents, are classified in the brackish group. The hydrogeological setting and boreholes log interpretation suggest that the saltwater is the result of Urmia Lake water that is entrapped within the fine-grained matrix from when the lake reached its greatest extent. The ratios of Na/Cl, Br/Cl, (Ca + Mg)/SO4, Mg/Cl, (2Ca + Na)/Cl and Rittenhouse diagram preclude halite dissolution as a salinity source and confirm that the lake water with the composition of seawater is the main cause of groundwater salinization. In addition, Li/Cl ratios indicate that the original briny water was somewhat affected by evaporation. However, the effect of evaporation was found to be, at most, a minor influence only. The views expressed in this paper are solely those of the authors and do not necessarily reflect the views or policies of the U.S. Environmental Protection Agency. Mention of trade names does not constitute endorsement. 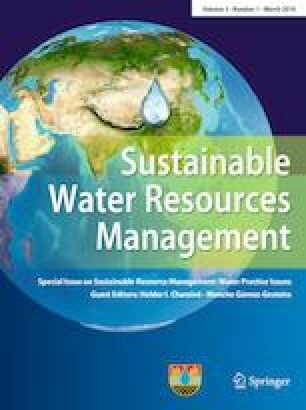 This article is part of the special issue on Groundwater Vulnerability. This research was supported by Tabriz University. We would like to take this opportunity to thank Tabriz University for providing financial support for this study.